I first met Mitt Romney in 2005. I was very impressed. I described him in this magazine as "informal, conversational, enthusiastic and speedy." Mitt Romney? Yes, indeed. But then, we were talking about something he really believed in, or seemed to: his universal health care plan for Massachusetts, which included an individual mandate--an idea I'd admired since it was proposed by Stuart Butler of the Heritage Foundation in 1989. Romney's plan wasn't the Full Butler, which would eliminate the deductibility of employer-donated health care benefits. But it was a huge step in the right direction, and Romney had mastered every detail of it. He seemed a near Clintonian policy wonk, a guy who certainly wouldn't have offered the disingenuous comments about health care that Romney did Sept. 9 on Meet the Press. In an attempt to sidle toward the center, Romney said he would embrace aspects of the Obama health care plan, like the mandate for insurance companies to cover all comers, including those with pre-existing conditions. Let us leave aside for a moment the well-known fact that Obamacare is, at its core, Romneycare taken national--and Romneycare taken national was the fondest hope of the fellow I met in 2005. What annoyed me was that, for the umpteen-hundredth time in this campaign, Romney was playing dumb on a subject he knew extremely well. His health care scheme and Obama's were dual-mandate plans. The insurance companies had to cover everyone, and the government had to require everyone to buy into the system. The insurers needed the larger pool of healthy policyholders to offset the cost of covering those who were already sick. And so I was prepared to whap poor Romney upside the head for this phony concession. But then Romney retracted it. Or an anonymous campaign aide did, saying Romney "was not proposing a federal mandate to require insurance plans to offer those particular features." And there, my fellow Americans, you have it: the Romney campaign in full flight yet again, embarrassed yet again. This is terribly sad. The guy I met in 2005 had potential. But the guy who ran for President in 2008 ran away from the guy I met in 2005, and the guy who's running this time has been even worse. He has made a public fool of himself, and it's important to ask why. 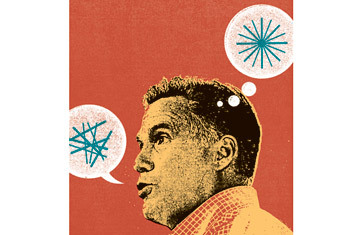 Romney's health gaffe came at a moment of peril for his candidacy. His party's convention had failed to lift him and would be remembered eternally for Clint Eastwood's empty chair. The Democratic convention, by contrast, had been extremely successful, even if Obama's speech wasn't. Indeed, the Obama people seem to have a far more sophisticated sense of how to run a campaign than the Romney people do. The Obama campaign remembered what Karl Rove had done to John Kerry in 2004 and performed an early advertising demolition job on Romney, defining him throughout the summer. Romney's campaign responded with an ad blitz in early September, "but there are diminishing returns for ads that run during the general-election campaign," a Republican strategist told me. "The public has been inundated."